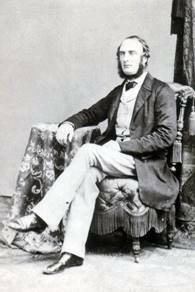 PALLISER, JOHN (1807-1887) geographer and explorer, born on 29 Jan 1807, was eldest son of Wray Palliser (d 1862) of COMRAGH, co WATERFORD, sometime lieutenant-colonel of the Waterford artillery militia by Anne, daughter of John Gledstanes of ANNESGIFT, co TIPPERARY. Sir William Palliser (q.v.) was his youngest brother. John was sheriff of WATERFORD during 1844, and served in the WATERFORD artillery militia as a captain. In 1847 he set out on a hunting expedition among the Indians of the western and north-western districts of AMERICA; and after going through many strange and dangerous adventures, returned to ENGLAND, and published in 1854 his experiences under the title of Adventures of a Hunter in the Prairies, of which the eighth thousandth with illustrations, and the title slightly altered, appeared in 1856. 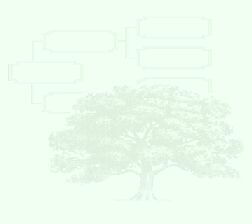 In the following year, Henry Labouchere (q.v.) secretary of state for the colonies, on the recommendation of Sir Roderick Murchison, the president of the Royal Geographical Society agreed to undertake the exploration of BRITISH NORTH AMERICA between the parallels of 49º and 50º north latitude and 100º to 115º west longitude. The treasury subscribed 5,000l for the purpose, and Palliser was on 31 March 1857 appointed leader of the expedition to be assisted by Lieutenant Blakiston of the royal artillery as astronomer, Mr Bourgeau as botanist, and Dr Hector as the geologist. His instructions were to explore a large part of the far west region of AMERICA to the shores of the PACIFIC, and topographically determine the British North American international boundary line from LAKE SUPERIOR in CANADA, across the main chain of the ROCKY MOUNTAINS, and thence to the western sea-coast. In 1857 Palliser explored the WHITE FISH and KAMINISTOQUVIAH RIVERS, and inspected the country between the southern branch of the SASKATCHEWAN and the boundary of the UNITED STATES, besides determining the possibility of establishing means of communication between the rocky regions of LAKES SUPERIOR and WINNIPEG and the prairie country. On a second expedition in 1858 he proceeded to approach the ROCKY MOUNTAINS from the BUFFALO PRAIRIE, between the NORTH and SOUTH SASKATCHEWAN, and then to explore the passes through the mountains lying within the British territory. For the results of this journey he was, in May 1859, awarded the Patron's or Victoria gold medal of the Royal Geographical Society. In 1860 he again proceeded towards the SOUTH SASKATCHEWAN RIVER, following the course of the RED DEER RIVER. He went westward to the ROCKY MOUNTAINS, from the point whence he had turned in his first season's exploration, and thus completed he survey of the hitherto unknown prairie region. 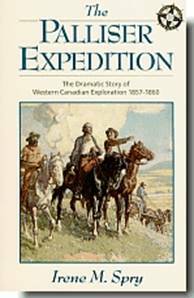 He also examined the country to the west of the COLUMBIA RIVER, establishing the fact of the connection of the SASKATCHEWAN PLAINS east of the ROCKY MOUNTAINS with a route into the gold-mining regions of BRITISH COLUMBIA. On his return to ENGLAND he was elected a fellow of the Royal Geographical Society, and on 30 May 1877 was awarded the companionship of St Michael and St George. He died unmarried at COMRAGH, co WATERFORD, on 18 Aug 1887. Note by TJS: John Palliser was the elder brother of my great-grandfather, Sir William Palliser. The DNB wrongly gives John Palliser's year of birth as 1807. It was 1817.